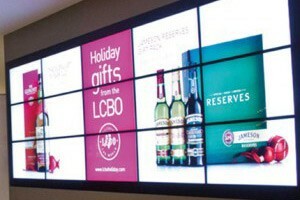 Videonations supply the very latest innovations in wireless AV presentation systems. Enabling you to collaborate, communicate and truly connect with your audience without the inconvenience of cables, they make switching between presenters seamless and enable the user to deliver highly-polished presentations every time. The new generation of collaboration equipment has never been easier to use and allows for data, video and audio to be displayed with no disruption whatsoever. To find out more about the wide-range of wireless presentation systems we offer or to book a demo, please contact our experts today. As organisations place a greater emphasis on collaboration they are transforming meeting rooms into collaborative spaces. To facilitate this, businesses are seeking innovative and user-friendly solutions for wireless connectivity of mobile devices such as; (tablets, smartphones and laptops) in order to optimise their presentation systems. 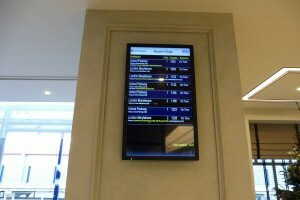 With over 15 years’ experience of integrating audio visual solutions into organisations within the UK and further afield, we have witnessed a noticeable surge in demand for wireless presentation systems. Through enabling all personnel to collaborate effectively, organisations across all sectors can benefit from the technological innovations now available. However, at Videonations we always bear in mind that that every business is different and has its own specific requirements. Therefore, we go to great lengths to understand what a customer really needs from a presentation system and offer expert guidance in choosing the appropriate solution. As we are independent we supply all the best products on the market from all leading manufacturers including Barco ClickShare. 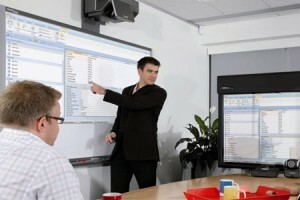 Connecting to your meeting room’s video system at the touch of button, ClickShare allows the presenter to get the presentation on screen in a second whilst enabling others to actively participate in the meeting. This can be done through either using the ClickShare button or by installing a simple app to share content from an android, tablet or smartphone. The system’s stability and ease-of-use is also proven to significantly reduce the workload of IT departments whilst enhancing the productivity of meetings and collaboration between participants. At Videonations everything we do is geared towards helping your business. Therefore, our fully comprehensive service encompasses every aspect of the process; from the design, installation and maintenance of wireless presentation systems through to the delivery of onsite and remote end-user training and support. In short, we can provide everything that your business needs to enhance your presentations and captivate and collaborate with your audience. The ClickShare allows participants to switch between presenters with ease helping people collaborate effectively at the click of a button. Android and iOS device users can also connect to the ClickShare by using a simple app so it’s not just for those with laptops. It delivers 30fps enabling users to share video and audio and other dynamic content. 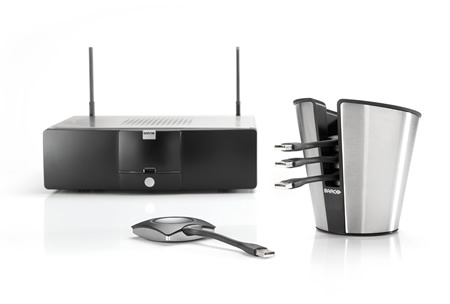 ClickShare from Barco is a full-featured wireless presentation system optimised for high profile meeting rooms and boardrooms. 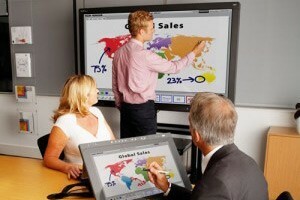 Removing the inconvenience of cables and incorrect aspect ratios offers simple switching between presenters and instantly increases group collaboration.